"The Social Tenure Domain Model - A Pro-Poor Land Tool" is a FIG Publication written by Dr Chriistian Lemmen. 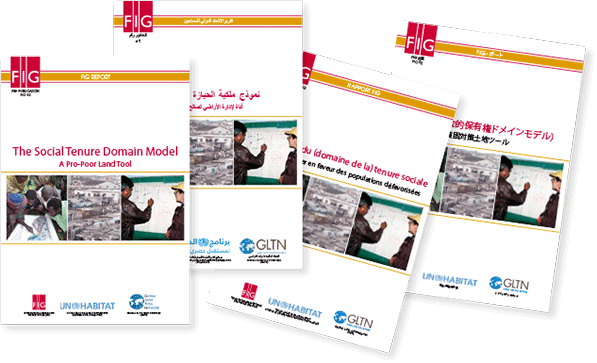 The FIG publication was published in 2010 and is a co-production between FIG and UN-Habitat/GLTN. A model has been developed to accommodate social tenures, termed the Social Tenure Domain Model (STDM). This is a pro-poor land information management system that can be used to support the land administration of the poor in urban and rural areas, which can also be linked to the cadastral system in order that all information can be integrated. The Arabic version was translated by GLTN, reviewed by Saad Kholoud who was also a great help when the publication was finalised for print, and published in 2015. The French version was also translated by GLTN, reviewed by Claire Galpin, and published 2017. The Japanese version was translated by Kazuaki Fujii, Japan Federation of Land and House Investigators’ Associationｓ (JFLHIA) Research Institute and confirmed with Japan Federation of Surveyors. Mr Kazuaki Fujii aalso assisted with the layout to ensure a correct language. A very big thanks to all who have helped with these translations.